The most inviting room in your home might be outdoors. 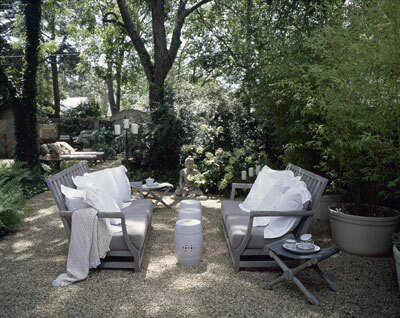 Embrace the good life in an outdoor room fitted with creature comforts and practical amenities. Let the garden experts from Better Homes and Gardens® magazine help you create a vacation getaway in your own backyard. Seek inspiration. 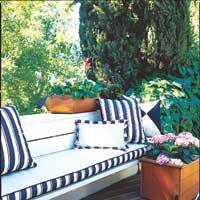 Keep a file of magazine clippings and photos of garden spaces that inspire and attract you. Revisit this file regularly to spark new ideas. Even very old photos or magazine features can be a source of ideas. Old styles are continually reappearing and being reinterpreted by new generations. You, too, may be able to put a fresh spin on an old idea. Study the site. An outdoor room should be a reflection of both the style and size of your house, and your personality. Make it the way you want it. But do make sure to recognize the limitations of your setting. For instance, you might not want to attempt a Tuscan garden in Seattle’s wet climate. Wooden columns and railings are classic elements that work with many houses. Use flooring and ceiling materials to reinforce a style, too. A 1950’s Colonial-style house, for example, will require a more traditional outdoor room than a contemporary 1990’s dwelling. When entertaining, it’s more relaxing for guests if one large space is subdivided into smaller rooms. Create a sitting area where you can visit with guests, and a dining area, devoted to eating appetizers or meals. For a sitting area, pull together a few chairs, possibly a rocker, and a side table. Furnish a dining area with a table and chairs. Consider adding a rug (all-weather if it will be exposed to the elements) to define an area. Visually separate the room with a tall palm or container plant. Container plants make ideal dividers because you can easily move them around. Your space may be tiny, but it can still be functional. Using small-scale furniture makes a little space appear larger because there is room to walk around. If the furniture is too big, the room feels crowded. A café table and two chairs make the perfect sitting area to enjoy a morning cup of coffee and read the newspaper. Remember, keep furniture and accessories to a minimum. Porches are making a comeback and once again being considered an extension of a home. To expand the indoors out, stick with a neutral color scheme that blends well with nature, then add splashes of color through accessories or flowering plants. Usually the back porch or side door of a home gets the most use. Kids and pets run in and out; groceries get hauled in from the car. Make it a welcoming spot by dressing it up with outdoor artwork and plants. Dogs want to be where you are, so keep them close; create a niche for them on the back porch. Make sure your pet has plenty of food and fresh water. Keep your dog safe by growing plants that are not toxic to pets. Develop a Theme. All the plants, structures, and hardscaping should work together to create a distinct sense of place. The Better Homes and Gardens® garden experts recommend sticking with three to five colors. Ensure Privacy. No matter how sociable you are, you’re bound to enjoy some private time. What better place to find it than in the garden? Hedges, thickly branched evergreens, and rapidly growing tall plants all provide privacy for your world. You can also ensure privacy by using fences, lattice, pergolas, and arbors to define outdoor spaces and screen views of neighboring houses. Define Spaces with Outdoor Structures. 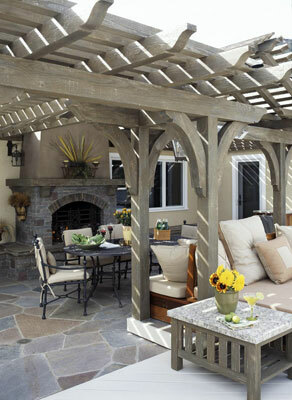 A shelter can be anything from a small, solid-roof arbor for reading to a large gazebo for entertaining. A gazebo adds another level of luxury to your outdoor oasis. Whether attached to the deck, set near a pool, or planted in the landscape, a gazebo is an outdoor room in its own right and offers a protected spot for dining, cooking, or relaxing. There are also portable shelters – tent-like structures that give the protection of a covered gazebo at a fraction of the cost. Some even have side curtains to deflect wind, or mosquito netting to intercept thirsty bloodsuckers. Create Shady Spots. Even sun worshippers welcome a little shade. You’ll enjoy your deck or patio more if you can provide relief from the sun. Choices for providing shade include mature trees, umbrellas, retractable awnings, or even pergolas and arbors planted with vines. For quickest cover using trees, try poplar (Populus spp. ), maple (Acer spp. ), black locust (Robinia pseudoacacia), and hackberry (Celtis occidentalis). Furnish for Comfort and Durability. Sitting on a large rock or log has a certain back-to-nature attraction, but for longer sojourns, you’ll want to support your back. 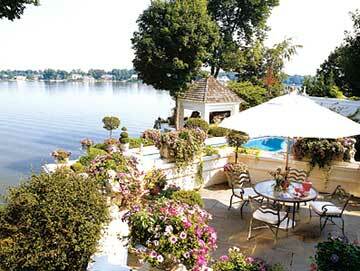 You have more choices than ever when it comes to furnishing your outdoor rooms. Wrought iron and cast iron, wrought or cast aluminum, and traditional wood are classic options. New synthetic, weatherproof patio furniture and fabrics are also now available, offering the same style and comfort as anything you would have inside your home. Just don’t forget the cushions and pillows! Plan Outdoor Lighting. 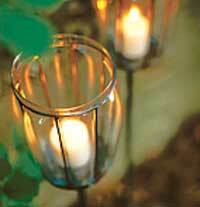 To enjoy your backyard getaway after the sun sets, include outdoor lighting. Outdoor lighting has a dual personality: it’s great for adding sparkle and ambience to the night, but it’s also important for safety. After all, you don’t want to be tripping over things in the dark. Torches and candles set a casual mood, whether they’re lining a path or standing sentinel around a patio. But if you go for artificial lighting, it doesn’t have to look artificial. There are many ornamental fixtures available. Pair them with light bulbs that cast a warm glow, and you have magic. Emphasize a Strong Focal Point. Look at the setting from inside your house and from the main approach. If your eye rests in a certain area – or you want to draw attention to a certain area – add a focal point such as a beautiful small tree, a topiary, a distinctive garden ornament, or some other treasure. Layer on the Amenities. 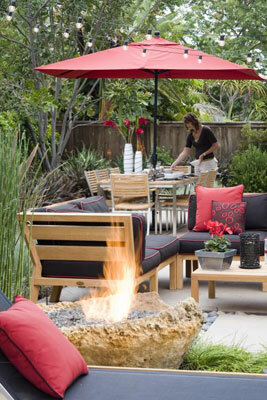 Fountains, fireplaces and fire pits enhance the beauty and usefulness of your outdoor rooms. Fountains add the soothing sound of trickling water and can serve as the focal point of an outdoor space. 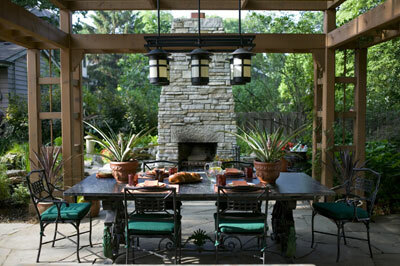 Fireplaces make a natural focal point and can help define and provide privacy for an outdoor room. They’re also a starting point for an outdoor kitchen. 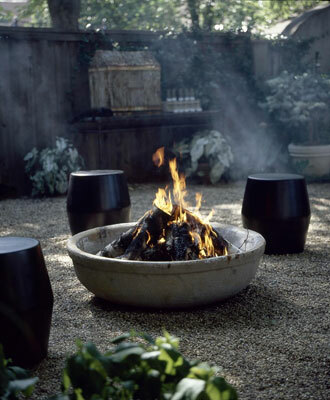 Fire pits, whether built-in or moveable, also serve to draw people together and can extend the usefulness of an outdoor living room into cooler weather. Finally, accessorize your outdoor room with garden statuary, weatherproof art (such as plates, garden plaques, or decorative wrought iron), and pillows covered in weatherproof fabrics. These touches will turn an ordinary patio or deck into a welcoming, personal space for outdoor living.